okh: 3D window did not update changes made in 2d (happned twice: move door / change level), but could not reproduce. hansmex: Same here. Happens every now and then. Not clear why. I checked again if I would have missed some updates in the 3D view, but did not discover anything. If you couldn't reproduce the issue, could you tell me if it happened more than once, and if you feel that this issue never happened in a previous version. Actually, I think something similar happened also in an earlier version, and that I reported it, but I cannot find the bug ticket (too hot outside...). However, it happened only those two times now - and not again. However, I am wondering whether there could be something Java related (1.7.0_55 / 32 bit), because some Java processes (also other sw) suddenly have hiccups. Eg. SH3D furniture import will sometimes halt everything for up to 20 seconds, and Collada export in Sketchup also seems to cause the occasional temporary freeze (and on an unrelated subject, so does my Java addicted bank). But no, it did not happen again (so just go ahead and release :-) ). Missing 3D resources might be a reason for this kind of bug. I wish I could, but I still have to check the Ni issue that sree.arun.kr reported, and a few translations are still missing. Are there Chinese (writing Simplified Chinese), Czech or Brazilian users around willing to contribute to translations? Just as OKH reported, the slow update of the 3D-image happened more than once. Unfortunately, I cannot reproduce it. It was very rare, and if I were you, I wouldn't worry too much about it. Yes it time to release v4.4 congratulations in advance. 1. I am talking about both "Ni" and "d". I think transparency value (Ni/optical density) may not be defined correctly also transparency color is not defined in .Obj format like in .dae does. When I work with glass material I always do this steps. 2. 3d window failed to refresh when it loose focusing(Out of focus ). Most probably when modify level window appears. You can also try by clicking and minimizing taskbar SH3D icon, then click any other program then re-open/pop-up SH3D by clicking again SH3D icon in taskbar band. (4 different furniture with different materials and a wall is in 2D view, select any of the furniture also). 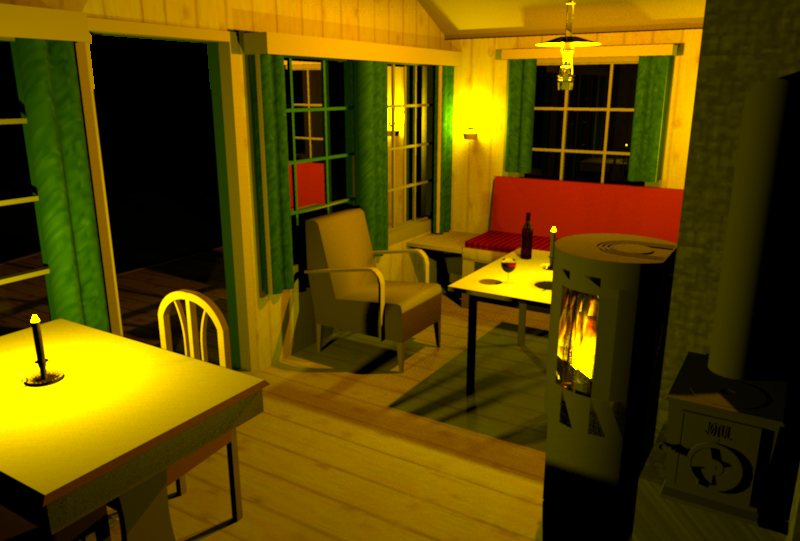 Else you can try by allowing pop-up furniture description window in 3d view, then scroll mouse wheel slowly. will be a very helpful. sree.arun.kr, thank you so much for finding out the eta / Ni issue. SunFlow doesn't seem to be able to handle values equal to 1. This value is found very often in MTL files and is actually wrong, because it matches the index of refraction in vacuum, definitively something not similar to a material! I fixed this issue by forcing the eta value to a minimum of 1.33 (the index of refraction of the water). And… it seems to fix (all?) the black dots problems, even black dots that appeared on furniture placed quite far from a piece of glass with a wrong Ni value. Please, dear users, check it on your side with the Beta 18 that I just posted. But I don't really understand the export to OBJ issue you mentioned in your message. If it's because 3DS files are transformed in OBJ files in a .sh3d file, it's on purpose and I won't change it, but you can keep the 3DS file unchanged by importing a ZIP file containing it. If it's because you specified some index of refraction in the 3DS file you imported, don't expect to find this value in Sweet Home 3D, because it is stored and reexported only for OBJ files. If it's something else, post or send me a way to reproduce it step by step. As far as I can tell, the demon is dead . Examples with lots of glass that used to have many black dots: SF Bug 271. 1. Import a model in .3ds or .dae format(*not OBJ) in an empty SH3d. 3. With out closing sh3d and without any modification for imported furniture, goto 3dview->Export to OBJ format,(export it as Untitled_Export.obj). 4. Render model and save image. 6. Using 7zip application Open saved work file(untitled_Save.sh3d). 8. Import these extracted content.obj and exported .obj in a new SH3D and render a view. You can clearly feel the differnce if the model consist of smoothed,complicated in shape and have different materials like glass, metal are used. 10. Exported Obj is bigger and different, but mtl file is almost same. If I import a model then export as obj then again import it in SH3D then again export the model, by repeating import, export steps more than a 10 times then the model and its material is completely changed(only skeleton exist). Wow.. the color combination &light is superb! especially in night bg. okh .